Whatever the results of the Local Council election tomorrow, one important factor is clear. The sovereign people, most of them now well informed largely because of high technology -- will no longer tolerate corrupt politicians. We hope those who are coming into politics will examine their conscience and ask whether they wish to sincerely, selflessly and sacrificially serve the country, people of all races and religions and bring about ethnic and religious unity in diversity. Specially during the past four decades, political corruption has become like a cancer. Therefore after February 10 non-party civic action groups need to give leadership and information to the people whenever and wherever bribery, corruption, serious frauds or other political crimes take place. In the January 8, 2015 Presidential Election, the main pledges included the restoration of democracy, the rule of law and tough action against those who indulge or indulged in bribery, corruption or serious fraud. To a large extent the restoration of democracy has come a long way specially with the 19th Amendment to the Constitution and the Right to Information (RTI) law being implemented effectively from February 3 last year. Last month alone there were about 100 appeals to the RTI Commission and the civic action groups are urging the people to make use of this RTI law to exercise their fundamental rights to the freedom of information and know what politicians are doing with public money. parties joined to form a National Unity or Consensus government. Tomorrow’s election will also be a major test for the new electoral system where 60 percent of the candidates will be elected on a first-past-the-post basis while 40 percent will be on proportional representation. Most analysts say some adjustment is needed, because voters will cast their ballots for a party and most of them do not know who the candidate is and whether he or she has been working with honesty and integrity. We hope that at the next election some adjustment will be made after consultations and consensus among all party leaders. Another important feature in tomorrow’s election will be that for the first time women will have a 25 percent representation. The elected women need to be aware that they have not only obtained a basic right but also have a serious responsibility. Most social analysts believe that without the strong voice, intuition and other qualities of women and specially mothers, all-male or excessively male decision making is often seriously flawed. 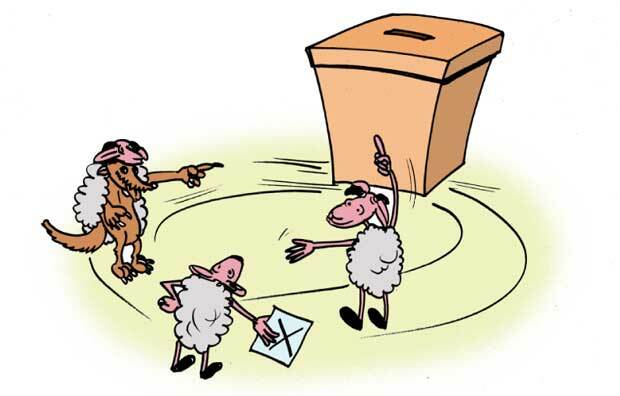 So with all these important issues involved, we hope that responsible citizens will see tomorrow’s election as a vital event and cast their votes without giving excuses or claiming that there is little purpose in choosing the lesser of the rogues. Voters need to think and act positively for the common good of our country and help build a peaceful, just and all-inclusive society.